How prepared is your business to recover when disaster strikes? Having a detailed plan in place to resume operations with as little disruption as possible is a must. Yet statistics suggest that 75% of small businesses operate without a tried and tested disaster recovery plan. As a result, almost half of these companies will be forced to close their doors during an unexpected event, and only 25% will ever reopen. An effective disaster recovery plan outlines the detailed steps to be taken in the event that a catastrophe happens. Without such a plan, lost revenue - coupled with unavoidable recovery expenses – could cost your company dearly. Insurance is important, but it won’t cover everything. And it certainly won’t guarantee the return of any clients forced to go elsewhere while your business is closed. 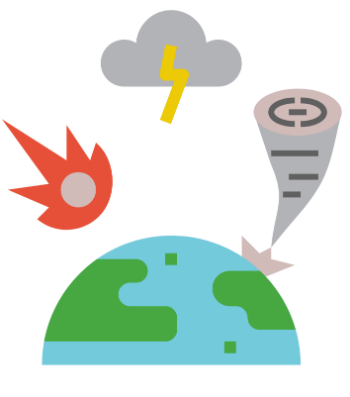 If you think catastrophe is unlikely to happen to you based on your geographical location, consider that only about one third of business outages are caused by natural disasters. Almost half are operational in nature, while a full 19% are the result of human error. It’s essential that your organization not only holds a disaster recovery plan, but that the primary goal of that plan be business continuation. Ideally, your recovery plan will address as many types of disaster as possible, since the disablement of any one department or system is likely to affect many others. In working through potential scenarios like these, be sure to consider not only which areas of your company are most likely to be affected, but for how long. If you don’t have the budget or personnel necessary to prepare for every conceivable event, you should do what you can to promote a speedy recovery from the hazards most likely to affect your particular business. First, you should take the time to conduct a business impact analysis. The purpose of this study is to identify critical or time-sensitive business processes, as well as the resources that support them. Second, you’ll need to ascertain and document how to implement recovery of those business functions in the event that they’re lost. Third, use the information you’ve gathered to compile a disaster recovery plan that will help you manage any business disruption. Working with a dedicated team is a good way to approach this. Last (but not least), make sure you and any team you head up regularly tests, practices, and evaluates your company’s recovery strategies. Your business continuity plan should address the specific order in which recovery events need to occur. It must also account for the people, equipment, and other resources necessary to make those recovery events happen. If you’re like most companies, your IT infrastructure is probably one of your most vulnerable areas. Recovery strategies for networks and servers, desktops and laptops, software and wireless devices are crucial. They need to be geared toward restoring systems and data as quickly and completely as possible, and should include manual workarounds. Start by identifying potential disaster events that might stem from human error, computer equipment failure, or cyber threats. Back up your data consistently, and find a way to keep those backups secure but accessible around the clock. Devise and document a strategy for restoring data, applications, and hardware inside an acceptable timeframe. Bear in mind that the key purpose of any business continuity blueprint is to respond as rapidly as possible in the face of disaster. Once your company has a viable recovery plan in place, a copy should be stored safely off-site where any team member can retrieve it. You should also make a point of reviewing, updating, and testing your disaster recovery plan regularly. Few business operations remain stagnant. And any change in your company’s growth or expansion could knock your plan out of alignment.